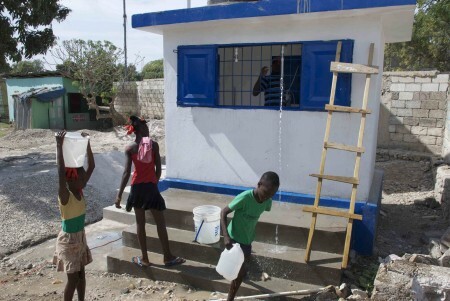 LGF Haiti just installed more water kiosks here in Tabarre, Port au Prince in partnership with the American Refugee Committee and the American Red Cross. These kiosks will serve a total community of over 10,000 people. The kiosks are being powered by solar arrays, an exciting component of the implementation. The solar panels were generously donated by Schuco Solar. 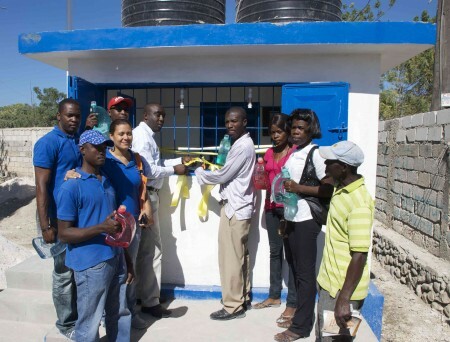 LGF Haiti held a training session executed by its in-country team at the Karade site (just near the US Embassy) which concluded with an official cutting of the ribbon ceremony. 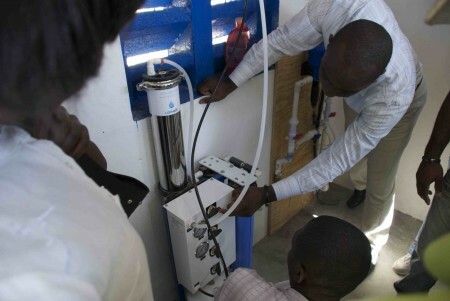 New containers were then filled with beautiful, clean water. 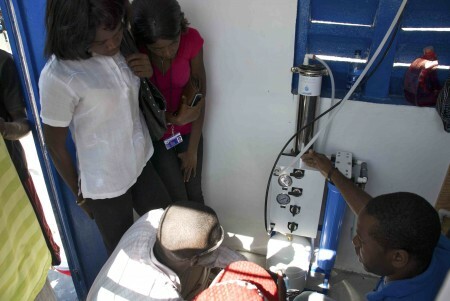 Johnson and Guilbert, of LGF Haiti, did a wonderful job of training the locals in the technical side of water purification while many others gathered outside proving that the kiosk will be a good place for the community. Johnson imparting just a fraction of his vast knowledge. This entry was posted in LifeGivingForce Foundation, Partners and tagged American Red Cross, American Refugee Committee, clean drinking water, clean water technology, Haiti, Haiti earthquake, LGF Haiti, Life Giving Force, LifeGivingForce. Bookmark the permalink. Post a comment or leave a trackback: Trackback URL.